Big Papi hits a Milestone…..
On Wednesday night, July 4, 2012, in Oakland, David Ortiz became the 49th man in baseball history to hit the 400 home run mark. It came in the fourth inning of a 3-2 loss to the A’s who completed a sweep of the Red Sox. “Big Papi” became the eighth player who, at one time or another wore a Red Sox uniform, on his way to the 400 home run plateau. He hit his first 38 home runs in the uniform of the Minnesota Twins and his milestone dinger was his 342nd in a Red Sox uniform. That is good enough for fifth on the all time Red Sox home run list. The other seven and in order of appearance. Babe Ruth hit the first 49 of his 714 home runs with the Red Sox. 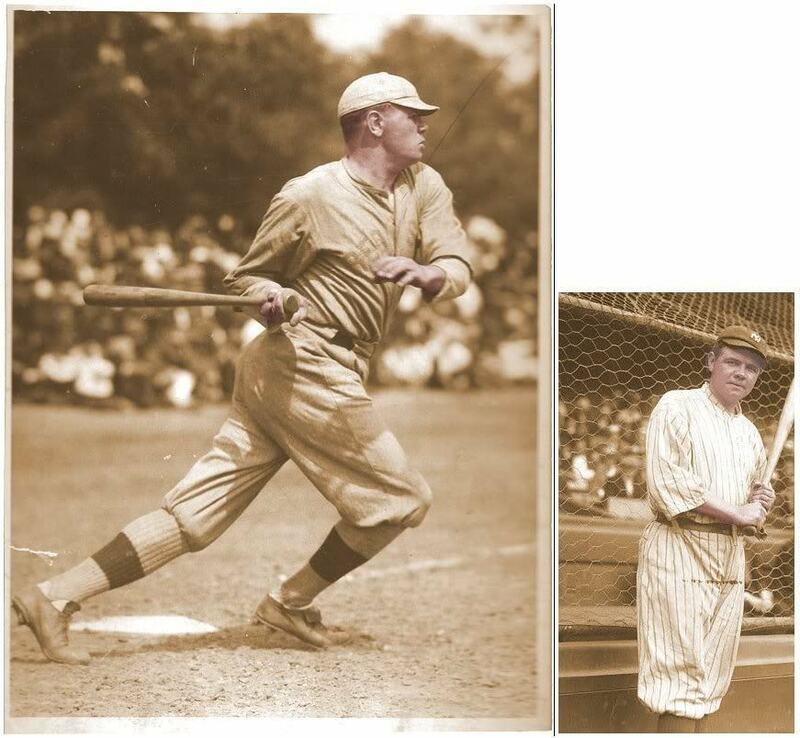 He led the league with 11 home runs in 1918 and again with 29 in 1919, that was his first home run record. He hit 658 home runs with the Yankees and his last six with the Boston Braves in his last season of 1935. His 400th home run came on September 2, 1927 at Shibe Park in Philadelphia and was number 44 on his way to his historic 60 home run season. A total of 49 of Babe’s dingers were hit at Fenway, 6.8% of them. Oh, and while I’m here, this is a good place to enter this trivia question; Who is the first player to hit 300, 400, 500, 600 and 700 career home runs? Hint…It’s the same guy! Next on the list is Jimmie Foxx, “the Beast” himself. 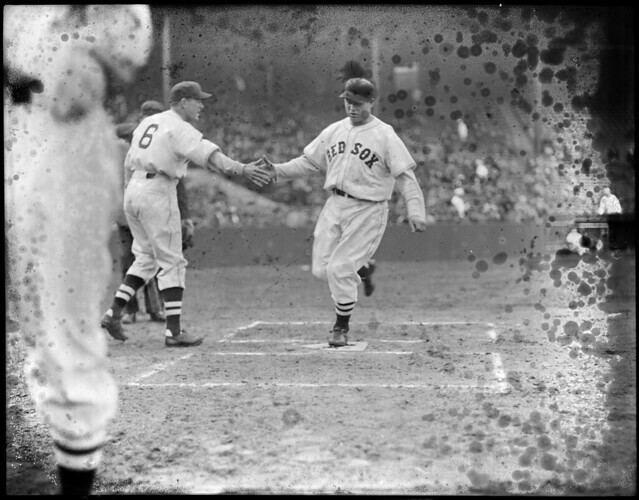 A familiar scene, Jimmie Foxx crossing home plate at Fenway Park following a home run. Old “Double X” clubbed career home runs number 303 through 524 while wearing a Red Sox uniform from 1936 through the 1942 season. He led the league with 35 home runs in 1939 following a year in which he hit 50 of them on his way to the 1938 American League MVP Award. 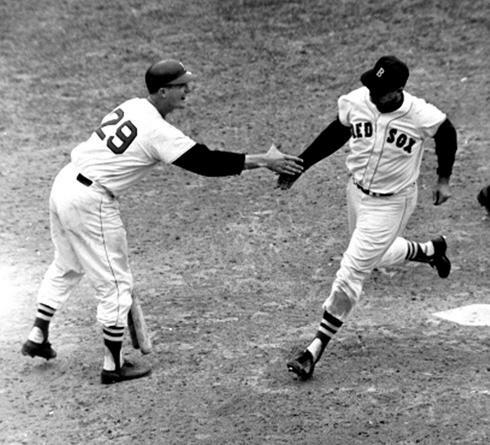 Foxx was the second player in baseball history to hit 500 career home runs, reaching the mark while playing for the Red Sox. It came in the first game of a doubleheader and was also at Shibe Park in Philadelphia on September 24, 1940. His 400th came in Cleveland in 1938 off of Hall of Fame pitcher Bon Feller. A total of 139 of his 534 homers were hit at Fenway Park. 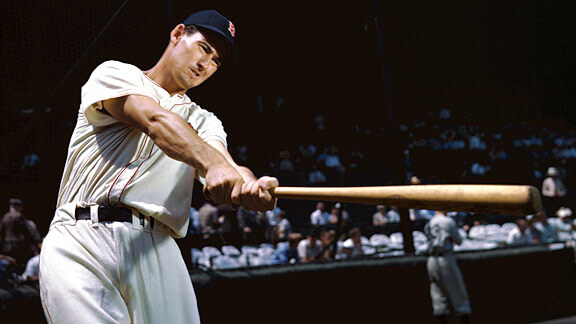 Ted Williams was the fourth player in major league history to hit 500 career home runs. His 500th came in Cleveland on June 17th of his final year in 1960.
he disappeared into the dugout and on to the pages of history, of legend, of folklore. There was no tip of the cap and John Updike told us why, “gods do not answer letters”. Ted hit 248 of his homers at Fenway Park, including numbers 300 and 400 which came off of Kansas City A’s pitcher Tom Gorman on July 17, 1956. The two time Triple Crown winner led the American League in home runs four times. His 521 homers have him tied for 18th on the all time list with Frank Thomas and Willie McCovey. The next Fenway Park legend on this list is none other than Carl Michael Yastrzemski. “The Captain” hit 452 career home runs, all with the Red Sox. Yaz is second on the all time Red Sox home run list and 35th on baseball’s all time home run list. He led the league but once in home runs, with 44 in his Triple Crown MVP season of 1967. However he was the first Red Sox player to have back to back 40 home run seasons when he hit 40 in 1969 and ’70’. A total of 237 of his dingers came at Fenway including number 400 which came off of Oakland A’s pitcher Mike Morgan on July 24, 1979. The next two, you may have forgotten but they both had quick two-year stops in Boston. One on his way to the Hall of Fame and the other on his way to immortality of a different kind. First the Hall of Famer. Andre “the Hawk” Dawson was the Red Sox DH in 1993 and ’94, hitting 29 of his 438 career homers in a Red Sox uniform. When Dawson arrived in Boston for the 1993 season, he had 399 career homers. On April 15th, just nine games into the season, he launched a Jose Mesa pitch into the left field screen in the second inning to tie the game and write his name in history. He hit but 15 of his career homers at Fenway Park but among them was his milestone 400th circuit clout. The guy who followed Dawson in the Red Sox DH position was Jose Canseco. Known more for his steroid whistle blowing than his 462 career home runs, Canseco hit 52 of his home runs in a Red Sox uniform. Last on the list is Manny Ramirez. When Manny arrived in Boston he had 236 home runs under his belt in the uniform of the Cleveland Indians. In the next eight years with Boston he clubbed 274 more including his milestone 400th and 500th career dingers. Both of them came on the road however with 400 coming in Seattle and 500 in Baltimore. His 555 career home runs has him sitting at number 14 on the all time list. In the interest of full disclosure, it must be said that Canseco is a self proclaimed steroid user and Manny has twice tested positive so their numbers must be looked at through the prism of performance enhancing drugs. And as much as it pains me to say this, David Ortiz has admitted that in 2003 he too tested positive. His claim is that he unwittingly took supplements which caused the positive test and I so want to take him at his word…..So I will. And so it is on this day in Fenway Park history, July 6, 2012. This entry was posted in Fenway Park Baseball and tagged 400 career home runs, Andre dawson, Babe Ruth, Carl Yastrzemski, David Ortiz, Fenway Park, Jimmie Foxx, Jose Canseco, Manny Ramirez, Red Sox, Ted Williams, Yaz. Bookmark the permalink.